Russian Custom Works There are 9 products. Mask"Arcann Swtor" is made of impact resistant reinforced polycarbonate.The helmet is Absolutely safe for playing airsoft! Body helmets, mesh and lens to withstand the impact of more than 200 meters per second in focus lead bullet with air gun! Universal size.The maximum head circumference is up to 64 cm. Helmet"Crysis" is made of impact resistant reinforced polycarbonate.The helmet is Absolutely safe for playing airsoft! Body helmets, mesh and lens to withstand the impact of more than 200 meters per second in focus lead bullet with air gun! Universal size.The maximum head circumference is up to 64 cm. Helmet"HALO" is made of impact resistant reinforced polycarbonate.The helmet is Absolutely safe for playing airsoft! Body helmets, mesh and lens to withstand the impact of more than 200 meters per second in focus lead bullet with air gun! Universal size.The maximum head circumference is up to 64 cm. 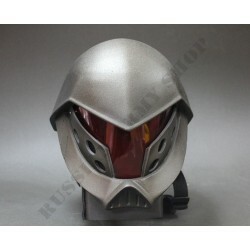 Mask"Darth Revan" is made of impact resistant reinforced polycarbonate.The helmet is Absolutely safe for playing airsoft! Body helmets, mesh and lens to withstand the impact of more than 200 meters per second in focus lead bullet with air gun! Universal size.The maximum head circumference is up to 64 cm. Helmet"Scifi Pilot" is made of impact resistant reinforced polycarbonate.The helmet is Absolutely safe for playing airsoft! Body helmets, mesh and lens to withstand the impact of more than 200 meters per second in focus lead bullet with air gun! Universal size.The maximum head circumference is up to 64 cm. Helmet"DOOM" is made of impact resistant reinforced polycarbonate.The helmet is Absolutely safe for playing airsoft! Body helmets, mesh and lens to withstand the impact of more than 200 meters per second in focus lead bullet with air gun! The maximum head circumference is up to 64 cm.